A few week ago, I visited the Spice Souq in Old Dubai. As I walked in to the alley ways, sided by tall walls, morning sun streamed in and a mix of delicate aromas wafted toward me on a gentle breeze. Turning a corner I saw heaps of spices, in an array of colours, beautifully displayed by local merchants. And I don’t mean only spices, there were dried flowers and herbs too. Beautiful lavender petals, vibrant green cardamom, dried turmeric yellow sticks, fiery red dried chillies, a mature ochre coloured dried lemons, a reddish-brown heap of cinnamon sticks, delicate pink rose buds, and jars full of the finest saffron. Not to be left out, there were mounds of dried apricots, walnuts, cashews and figs. 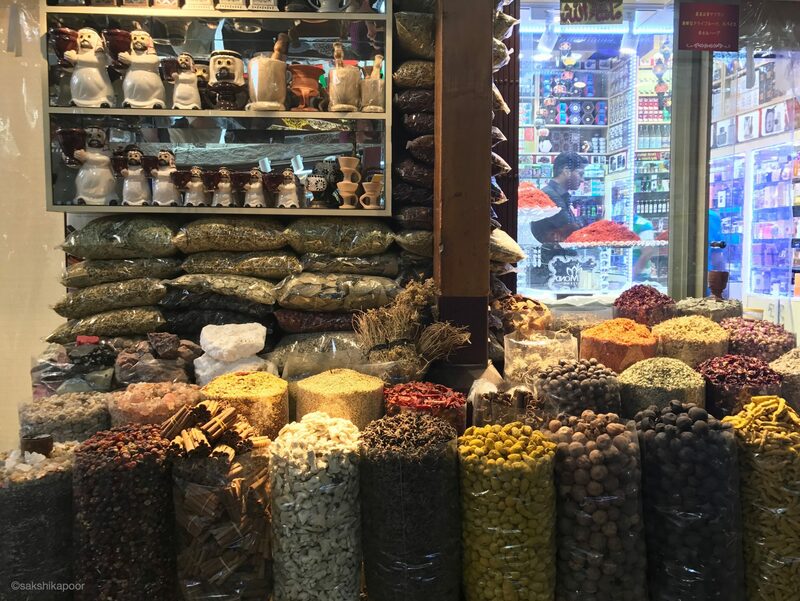 The souq is a food lover’s paradise and a feast for the senses. So much inspiration for a cook, all in one place! I couldn’t pick up many items there as my pantry was already well stocked, but I did buy some dried oregano, mint and dried lemons. 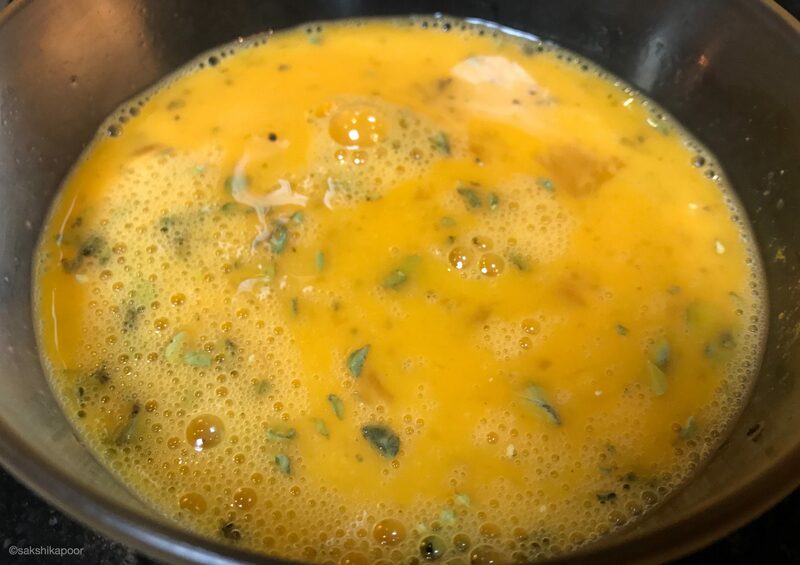 Meanwhile, Kanika shared the lovely broccoli frittata recipe and gave me a dinner idea for a herby egg rice. I really wanted to use the herbs in a dish soon. Eggs being versatile and quick to cook came to mind and then rice, well we have a lot of rice in our meals. That’s how I came up with the thought of making a herby egg rice cooked with generous quantities of newly acquired goodies from the souq. 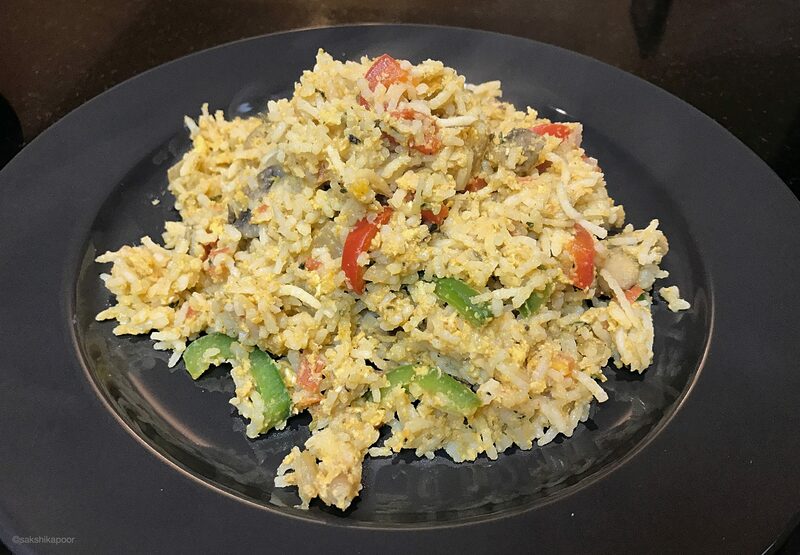 So here’s how I made this Egg coated rice that is loaded with herbs and stir fried veggies! I used a lot of vegetables here so the ingredient list may make it sound more complicated than it is. I was just lucky to have a lot of colourful vegetables in my fridge that evening. 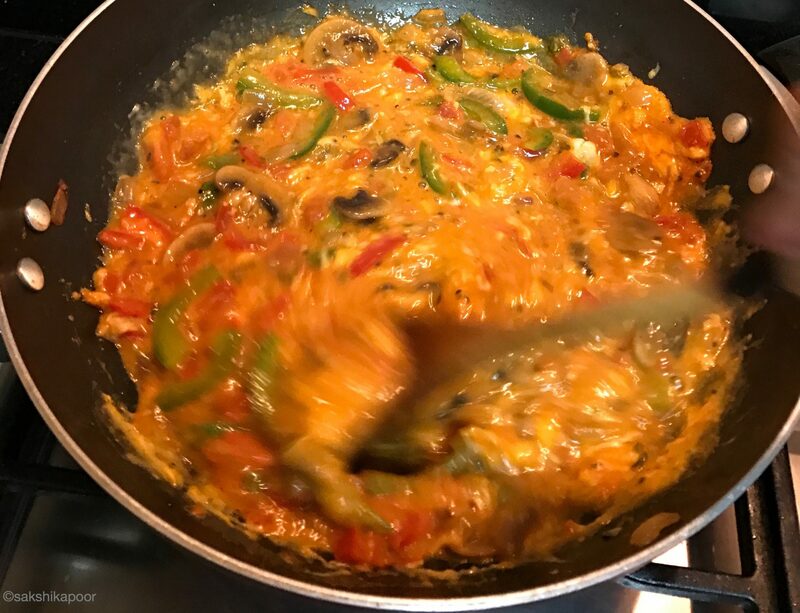 You can make the same recipe with just onions, tomatoes and garlic as well. Shredded cabbage, when not overcooked, adds a nice crunch to the recipe. Start with some oil in a pan on medium heat. Heat the oil and add cinnamon followed by a pinch of coarsely ground black pepper. Next, add the chopped garlic and cook it for a while. Follow with the chopped onions. Fry till they are translucent and then add mushrooms. 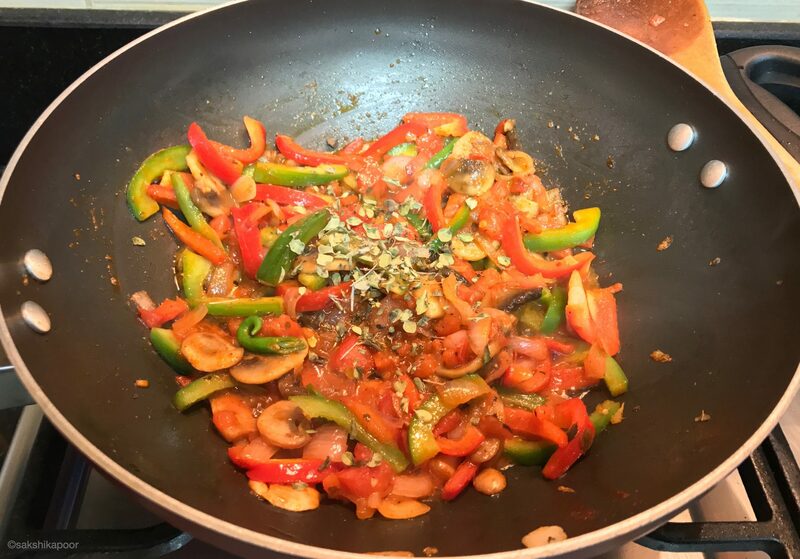 Cook for 2-3 minutes and follow with the tomatoes and green chilli. 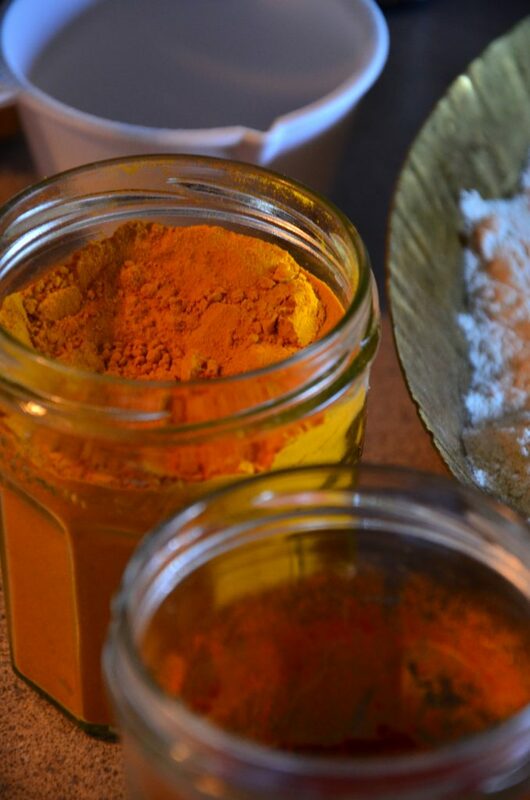 After the tomatoes go in, you can add salt along with chilli powder and a touch a turmeric to add a bit of colour. Salt helps to break down the tomatoes and they start to become mushy in some 5 minutes. I added bell peppers in the end because I like them to be crunchy and so they don’t need much cooking. Next I put in some oregano and black pepper and then I gave the veggies a good mix. You can reduce the heat now or even turn it off. 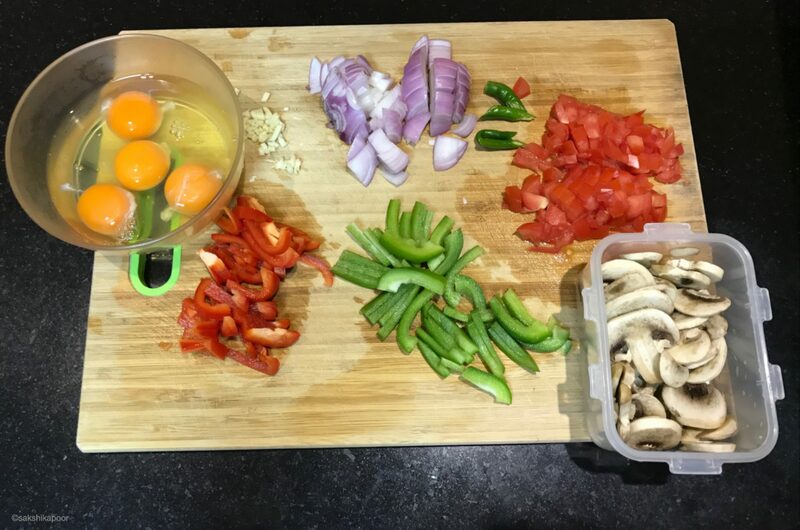 While the veggies are on sim, break 4 whole eggs in a bowl, add little salt (remember, the veggies already have a bit of salt), oregano and black pepper. Beat well and transfer to the pan. On low heat mix in the eggs nicely with the veggies. Don’t wait for the eggs to start curdling, the point is that the flavours of the veggies mix well with the eggs. While the eggs are still uncooked, add steamed rice and start folding them in gently. 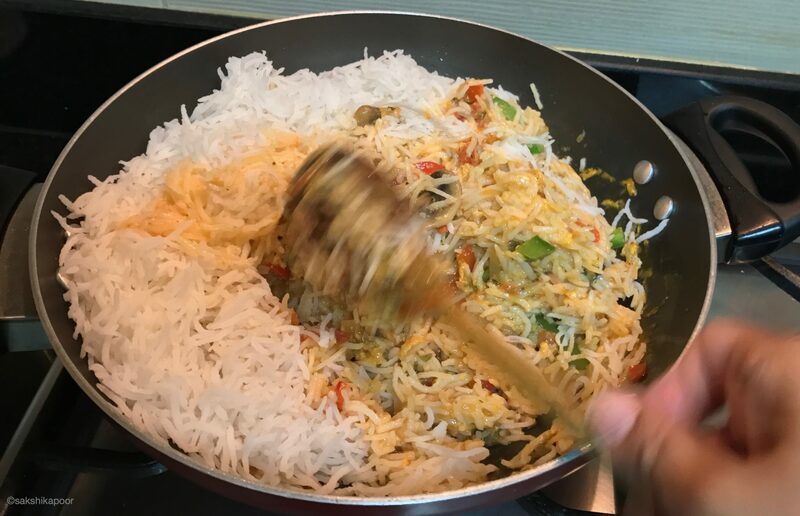 I use Basmati rice, which I prepare by boiling in a large pot and then straining followed by some resting. Cooking them this way makes the grains fluffy and prevents them from becoming sticky. You can use any rice you like. 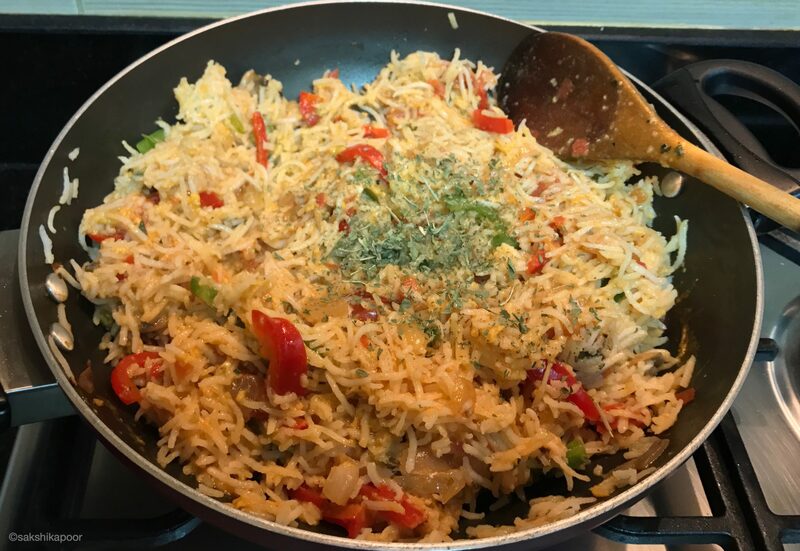 Once the rice is well coated with the mix of eggs and vegetables, cover and let it cook for 4-5 mins on low heat. Check and stir so to prevent egg from sticking to the bottom. Cover and cook for another 4-5 mins on low heat. Once you see that the egg is cooked and has coated the rice well, sprinkle some dried mint leaves and your Herby Egg Rice is ready to serve!